Mud baths and underground mud baths are treatments that involve immersing the body in mud. The treatment is called Fangotherapy, where mineral-rich mud is spread all over the body to help in rejuvenation. These session include mud baths, massages and mud packs which help in eliminating toxins and cleanse, purify and revitalise the skin. Apart from skin purification, mud baths work as detoxes and a method to alleviate muscle and body pain. How are mud baths beneficial? Mud baths or the use of mineral-rich mud and clay for skin and body rejuvenation is an age-old practice. What exactly does it do? Mud baths that use dead-sea bud help with skin conditions like eczema, psoriasis, acne and dry skin. 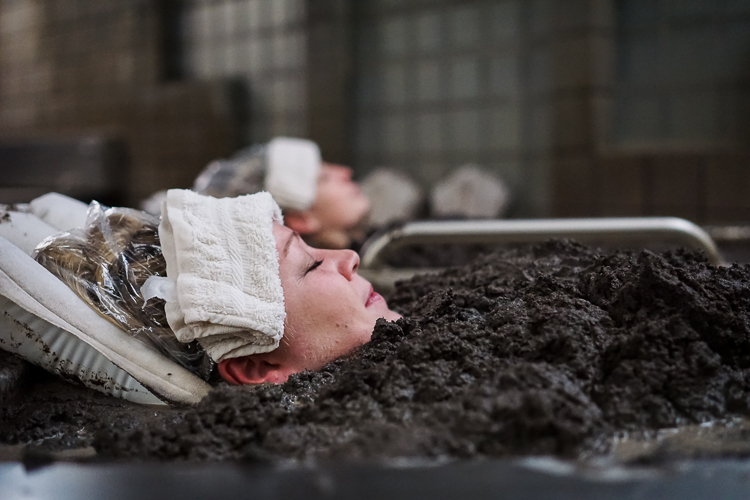 Analgesic mud bath treatments help relieve painful conditions like osteoarthritis, rheumatoid arthritis, fibromyalgia and chronic muscle pains. Detoxifying mud bath session improve your blood circulation, open up pores and increase waste exchange and skin elasticity. What happens in a mud bath session? Therapeutic mud baths use mud rich in beneficial minerals like magnesium, sodium and sulphur. In a session, ideally you will be bathed neck down in a bathtub filled with heated mud for maybe 15-30 minutes. After a wash, these sessions are usually followed by deep tissue massages, body masks and steam baths. Mud bath therapy performed by a trained therapist can be very beneficial as the massage that follows works deeper into your tissues and helps alleviate pain. It also works as a skin detox, improving your skin texture, healing it from the inside.